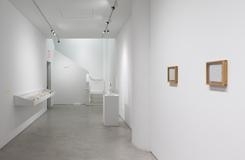 Alexander Gray Associates presents Luis Camnitzer: Short Stories, featuring new work in a variety of media, including: video, printmaking, and modified readymade objects. For his fifth solo-exhibition at the Gallery, Camnitzer employs his characteristic wit to investigate notions of time, creating open narratives for viewer engagement, redefining established systems, and questioning assumed realities. His recent work speaks to his belief in art making as a platform for organizing and acquiring new information through the decontextualization of familiar tools and objects. Debuting in the second-floor gallery space is The Time Project (2017) a large-scale installation that brings together different indicators of the passage of time, both natural and cultural. The work is comprised of a free standing room that frames a floor video-projection of a stream in the woods, and two modified wall-clocks situated on opposite sides of the gallery. The short-loop video depicts a stream of clear water, the surrounding vegetation, and sounds of nearby nature and distant church bells. The arrhythmic bells cease to announce the hour and instead become a circular sound element similar to the flow of water, removing a linear marker of passing of time. Anchoring the installation are the clocks, which face the doorways to the centrally-situated video room. Camnitzer has modified the wall-clocks, shedding their function as timekeeping devices; in one case, tangling the hour and minute hands with a length of string, and for the second clock, hanging it upside down, though setting the hands to the correct time. The installation constructs a narrative around time that inverts notions of progress, suggesting an alternative understanding of the indefinite continued passing of events as a circular phenomenon. On view on the ground floor of the Gallery are five works from “Improbabilities,” a new series of dice assemblages contained in artist-made frames. Each Improbability is comprised of 100 dice organized into a perfect square. Using the dotted surface of the dice, Camnitzer creates five distinct patterns that rely on numerical repetition. The artist brings together objects which would traditionally be rolled to achieve an arbitrary outcome and implements visual order in place of potential randomness. His use of dice is representative of his ongoing interest in both literal gameplay as well as the way in which he views art and life: as a game in and of itself. The artist’s longstanding interest in using language to construct images is apparent in his portfolio of Xerox prints, Timelanguage (2016). The set of 12 prints spells out the made-up word “Timelanguage,” beginning on the first sheet with only the letter “T.” Each consecutive print reveals one more letter until the full word is rendered. Printed on a gradient from a light gray to black so that the first print is the lightest, and the last is the most pigmented, the sequence uses these visual markers of accumulation and addition to signify the passage of time and information. Also on view is the mixed media installation, Bereaved-Bird-Bit-Bloody-faced-Bohemian (2017), the title of which refers to the headwords on the pages of five open unabridged Merriam Webster dictionaries; books which serve as indexes of verbal communication. He constructs a short, but fully-realized story from the alphabetically-arranged words that were designed as tools to help readers navigate books which are becoming less prevalent in a search-driven digital era.